I love homemade pizza more. Despite my dairy affliction, I generally consumed a lot of pizza pre-gluten abandonment and would just skip the cheese. But let's get real, what's pizza with no crust AND no cheese?! The very first thing gluten-free time I bought was Bob's Red Mill Gluten-free Pizza Crust. I was pretty excited since Bob's Red Mill generally gets high marks for their gluten-free line. However, the first attempt was vile. I really didn't like the pizza at all. It was so obviously NOT pizza crust, beyond being bland, the taste was gross. However we have made our our pizza crust for some time, and I figured there was an easy solution. I tried it again, and this time it was much better. Follow the instructions. After the resting/rising period mix in 1 clove of garlic, 1 tsp onion powder, salt + pepper (as much as you dare) and 1 tsp Italian seasoning. Divide into two portions, wrap and place in the fridge for a few hours to 3 days (that's as long as the mix lasts in the fridge). 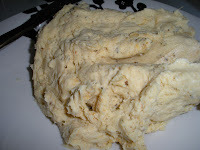 The longer your dough is in the fridge, the more time the spices have to permeate and flavor it. 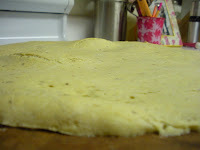 Roll the dough out super, super thin. 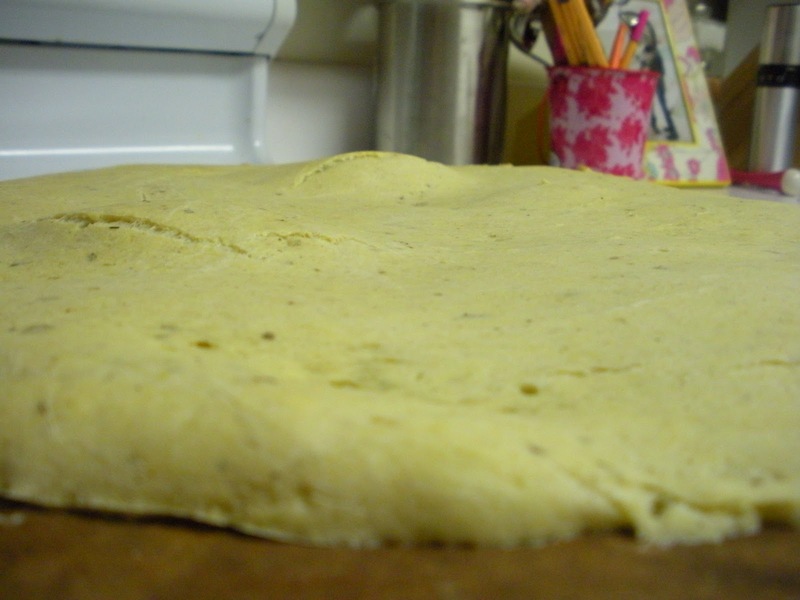 This dough really rises in the oven... like crazy. The thicker the dough is, the worse it tastes. According to the package, this mix makes one 16 inch or two 12 inch pizzas. Not true. I rolled 1/2 the mix out to the very, very edge of our pizza stone (16 inches) and once it came out of the oven, it still rose to be pretty thick! I think you can easily get two 16 inch pizzas out of this mix. The thinner, the better. 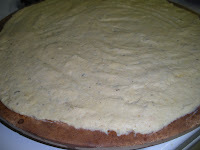 So, roll it as thin as possible and then stick it in the oven for 11-12 minutes before topping. 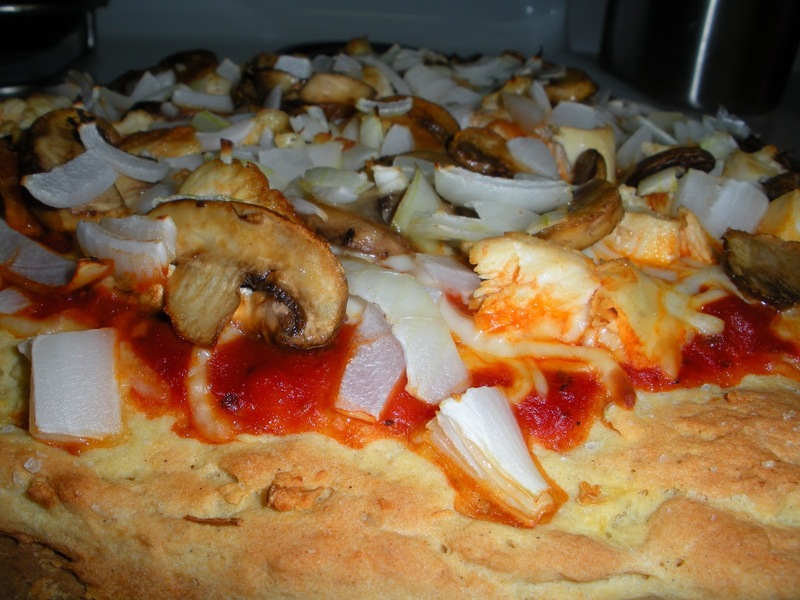 Personally, I think the crust really needs to be in the oven before longer than the instructions listed before toppings can go on, otherwise it's soggy. Ovens do vary though. I reduced the amount of time that my pizza was in the oven with toppings to compensate (12 min). Flavor the crust. Anything that won't be covered by sauce (which needs to be as little as possible!) needs help. Sprinkle some salt. Rub in some garlic and oil. Add some pepper and other seasonings. Grind on some hard cheese (asiago, romano, parmesan) if you aren't allergic. It will sooooo help. Add your toppings, bake and enjoy! 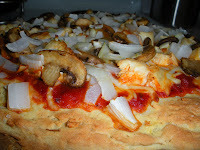 We're going to have this again tonight with some ham and pineapple on top. I'm pretty excited. I hope you had a safe black friday! I have to say, I left for work this morning at 2 am and just got home at 2 pm.... it was AMAZING to me how many people were out shopping so early this morning! Hats off to them, if I had the choice, I'd have been sleeping every time. And now... it's time to relax with John before drifting off (finally) to sweet dreams! As always, enjoy your day and thanks for reading!